Now in its third year, the Father’s Day 8K – to be held at 6:30 p.m. Sunday, June 17 – will feature an Olympian, a national champion at distances ranging from 50 to 100 kilometers, some of Georgetown Running Company Racing Team’s best athletes, a 1K fun run for children, and plenty of free cupcakes. Held on a flat-and-fast, out-and-back course on the C&O Canal Towpath in Georgetown, the GRC Racing Team-produced event has a tradition of providing families with the perfect outing to cap the holiday. And the event is perfectly timed with Men’s Health Week, part of a month-long campaign to heighten the awareness of preventable health problems and encourage early detection and treatment of disease among men and women. “An evening race gives dads the morning to sleep in and the afternoon to spend with their families. 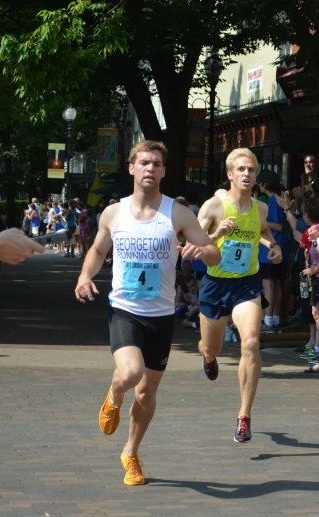 Then they can bring the family to Georgetown to cheer for them while they race and cap off a relaxing Fathers Day taking everyone to Thomas Sweet for a well-deserved ice cream,” Race Director Patrick Murphy said. During the Father’s Day 8K, most of the racing team’s members will volunteer rather than race. The event serves as the club’s sole source of funding, which allows members a modest stipend to travel to professional competitions and national championships to represent both the team and the regional running scene. All participants will receive a technical race shirt. Awards will be presented at a post-race happy hour at Chadwick’s to the top three men and women, the top men and women in each 10-year age group, and to the top Father-Son and Father-Daughter teams. 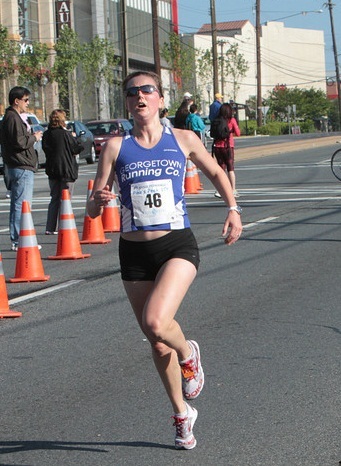 For marathoner Claire Hallissey, 29, a U.K. native who has lived in Arlington, Va., since 2010, the Father’s Day 8K will serve as one of her final tune-ups before she heads to London to represent Britain in the summer Olympics. “The timing of the events works perfectly into my training for the Olympics, and the canal is one of my favorite training spots,” said Hallissey, who claimed a place on the Olympic marathon team by running 2:27:44, good for 10th overall, at April’s Virgin London Marathon. On the men’s side, the Father’s Day 8K features Michael Wardian, a 37-year-old Arlington resident who works as an international ship broker at a Georgetown company. In addition to that, Wardian, a father of two, has racked up national titles at 50K and 100K, is a three-time Ultra Runner of the Year, and has won the District’s National Marathon six times. In last year’s Father’s Day 8K, he placed third just a day after running a new personal marathon best of 2:17:49, qualifying him for his third U.S. Olympic Marathon Trials. Representing GRC, Laura O’Hara and Ryan Witters will be in the mix of contenders vying for titles. O’Hara (right), 32, of Alexandria was a two-time Foot Locker finalist who later competed for Stanford University, and was twice ranked in the country’s top 10 for the steeplechase. The U.S. House of Representatives historian was the top American at the 2010 Woodrow Wilson Bridge Half Marathon, and is coming off a personal best of 35:51 at the Pike’s Peek 10K in April. Witters (left) lives in the District, and is a 2011 graduate of the University of Evansville. The engineer at Clark Construction has run personal bests on the track this spring in the 800, 1500, and 5,000: 1:54.3, 3:53.6 and 14:40, respectively. The race will start and finish on the canal towpath in Georgetown at Potomac and Grace Streets, NW, and the turnaround is near Fletcher’s Boathouse. Water will be available at the midway point. After the race, participants will be able to enjoy refreshments from our featured sponsors, cupcakes provided by Georgetown Cupcakes, and meet with representatives of the Men’s Health Week Campaign. After the post-race celebration and awards ceremony, all participants are invited to a happy hour at Chadwicks (3205 K Street NW, D.C.), which will offer beer and appetizer specials. 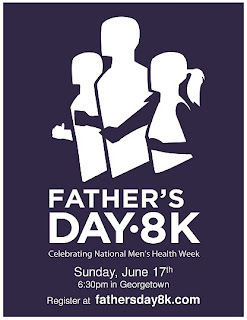 To register, and for more about information about the race, go to www.fathersday8k.com. On race day, registration will held at the Georgetown Running Company (3401 M Street NW, D.C.) from 2-4:30 p.m., and at the start/finish at Potomac and Grace Streets from 5-6:15 p.m. To enter the father-son and father-daughter competition, email fathersday8k@gmail.com.